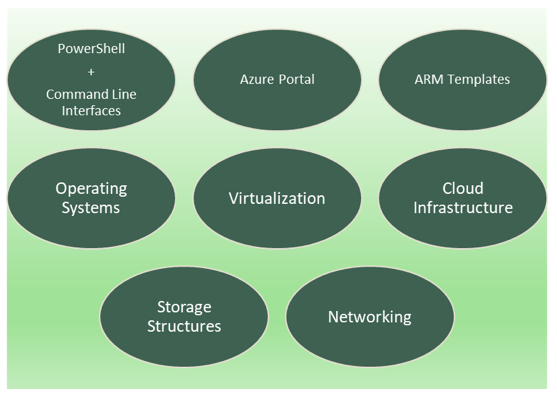 Blog Microsoft Azure How to Prepare for Microsoft Azure Exam AZ-101? If Azure AZ-100 exam is for Azure Infrastructure and Deployment, then there’s another exam to test your knowledge on Azure integration and security. This exam is known by the exam code AZ-101. It is the second step towards becoming a qualified Microsoft Certified Azure administrator. 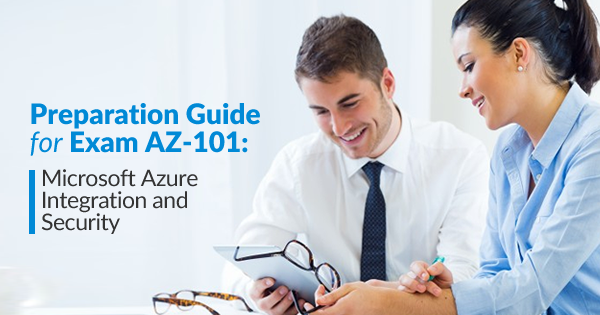 If you are referring to a Microsoft AZ-101 exam preparation guide, you may not find considerable differences in the basic concepts from that of an Azure AZ-100 guide. 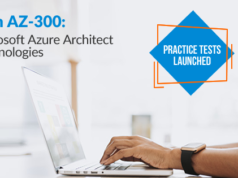 Of course, your AZ-101 exam preparation must not be focused on devouring some skeptical theories since this exam is for testing your knowledge and expertise on a real Azure environment. In order to cope with that, we’ve formulated a definitive guide of AZ-101 Integration and Security exam study materials which you can simply redesign and adapt for your own Microsoft AZ-101 Integration and Security exam preparation strategy. As you know, just like AZ-100, this exam is also for Azure administrators who can manage services over the cloud that spans over multiple capabilities such as storage, security, compute, and networking. Candidates who are opting for an AZ-101 exam preparation must have a deep perception of how each service works on an IT infrastructure. And he/she should take requests and give recommendations for infrastructure services for using them based on various measures like scale, performance, size, provision, and so on. So, let’s dive deep to get more details. A candidate who wants to get passed in AZ-101 exam must be proficient in certain skills such as Windows PowerShell and command line interfaces. He/she should be aware of or familiar with technologies such as operating systems, virtualization concept, cloud infrastructure, storage structures, networking, ARM templates, and the Azure portal. So, the AZ-101 exam study guide you choose for your AZ-101 exam preparation must be exhaustive enough to meet your needs. 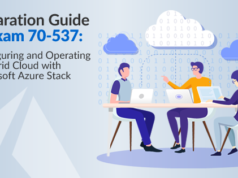 And you must know that the things, study materials, and the methodology you are using for any Azure certification exam preparation can get outdated at any time. It’s mostly because of Microsoft’s policy to keep Azure as a glitch-free cloud-based infrastructural platform so as to cope with its competitors. This should also keep in your mind before choosing AZ-101 Integration and Security exam study material you need. Preparing for Azure AZ-100 exam? Here’s AZ-100 exam preparation guide that will help you pass the exam in a first go! You can locate the official AZ-101 resources on the “Learning” section of the Microsoft portal itself. Here you’ll see all the basic stuff required for AZ-101 exam preparation including preparation methods, pricing information, exam scheduling options, skill assessment information, exam prerequisites and so on. However, if you think it’s not enough, you can come back and plunge into the in-depth AZ-101 exam study guide. Since AZ-101 and AZ-100 exams are coupled to form a single role – Microsoft Certified Azure Administrator Associative, there isn’t any difference in the exam pattern or types of questions asked in each exam. We’ve already discussed AZ-100 exam pattern in its exam preparation guide. Anyhow, no worry even if you haven’t noticed it – we’ll clear it. There’ll be around 40-60 questions in each AZ-101 exam. Some of the questions can be answered in one word while some may require long and explanatory answers. Here comes the reason for most of the failures in this exam – some of the participants won’t even try to read the test question clearly. Suppose if they get a question that needs to answer in exact three points, they may either try to explain with more points or give a lesser number of points in the answer section. This answer will get marked as incorrect at the time of evaluation – only happens because of the negligence of the participants. And, you have a total of 180 minutes of time for the whole exam. Out of which 30 minutes are reserved for instructions, comments, etc. All you have to do is to effectively utilize the remaining 150 minutes to answer questions. There will be questions that you can’t skip and some questions carry more marks than others. Also, there’ll be different types of questions such as the active screen, build lists, and so on. If you are not sure about the answer for a question, it’s possible to mark it for answering later. Finally, there’ll be a case study in each Azure administrator exam for which you’ve to give appreciable importance in your AZ-101 exam preparation. Here you’ll be presented with a scenario related to Azure integration and security where you’ve to define some environment characteristics taking performance and cost into consideration. Based on that, there’ll be answer choices from which you’ll have to choose the correct one. Sometimes, you may choose an answer that satisfies an organization’s business needs. At the same time, there can be a sharp dip in performance/technical perspective of the system. This can also happen vice versa. So, while choosing an answer to such a scenario, both types of requirements should be kept in your mind. Have already passed Azure 70-533 exam? Validate your Azure Administrator knowledge with Azure AZ-102 certification exam. 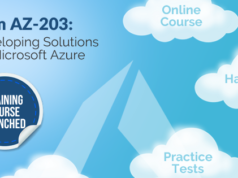 Get more details about the exam in Azure AZ-102 Preparation Guide. 15 to 20% of questions can be based on this section. There are two subsections in this part. 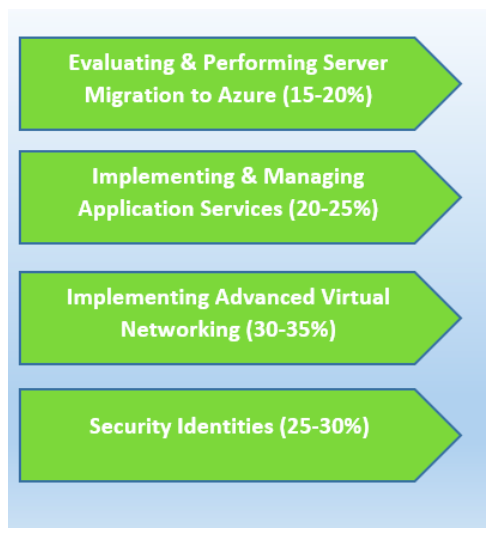 One is using Azure Migrate to evaluate migration scenarios where you may find and assess the environment, locate deployment issues, find ports to open, configure domain accounts & credentials, identify network changes, check whether destination environment and so on. In the second subsection, you may migrate servers to Azure using ASR (Azure Site Recovery) or P2V. Also, here you have a lot of other tasks including deployment of ASR agent, virtual network creation, storage configuration and so on. This portion has to give the highest weight in your AZ-101 exam preparation since 30 to 35% questions will be based on this part. Implementation of application load balancing and Azure load balancer comes under this section. Also, you have to do tasks such as monitoring networking and integrating on-premises network with Azure virtual network. Around 25-30% questions will be based on this section. Here, you’ve to implement MFA (multi-factor authentication), manage RBAC (role-based access control) and managing Azure AD privileged identity management. If you think that the Microsoft AZ-100 Integration and Security exam preparation is too hard, we have got a specific methodology which you can follow to alleviate this thought. This won’t cost you anything but some part of your time and effort. It’s described in the steps below. Microsoft has a portal specific to its exams and certification known by Microsoft learning. There you can find a lot of resources for your AZ-101 exam preparation including exam scheduling options, preparation tips, syllabus of the exam, pricing chart, and so on. Whenever there’s a change to any of Microsoft’s exams structure, it’ll first appear here. Since we’ve checked the details of exam structure, it seems better not to repeat again here. Following the syllabus strictly for your AZ-101 exam preparation can only help you to score more marks in the exam. Microsoft Learning portal provides different training courses for each module in the AZ-101 exam. These courses will be online based which are provided by different Microsoft partners. You can locate and contact a certified Microsoft trainer from your area itself. There’s a book written by Michael Washam namely “Exam Ref AZ-101 Microsoft Azure Integration and Security”. This book suggests a professional approach for candidates to maximize their performance in the exam and thus helps the candidates to prepare and pass the exam. If you want a serious AZ-101 exam preparation strategy, make sure you haven’t neglected the importance of forums or discussion forums. This method can help you to resolve many recurring questions that can come to your mind. You can discuss your doubts with other AZ-101 exam aspirants here. Initiate a discussion on AZ-101 exam in the Whizlabs forum to get answers to all of your questions by the experts. Generally, the candidates who prepare for certification exams have many questions in their mind. The questions may arise before, after, and during the exam preparation. So, here we bring some of the most common AZ-101 frequently asked questions with the explanatory answers. 1. How much I need to score in order to pass the AZ-101 exam? Answer: No preparation guide for Microsoft AZ-101 exam can help you to pass this exam unless you know how to effectively score marks in any case. If roughly say, it is 700 marks that’s set as the cut-off for AZ-101. Also keep in your mind that, it isn’t 70% marks. And, the difficulty level of questions allocated to you will be determined when you start the exam. So, the questions are neither going to be easy nor will be difficult once you pass through the exam. In the very beginning of the exam, you may see a number of introductory questions where you have to specify your experience level associated with the basic concepts needed for this exam such as networking, compute, security etc. Now, you may think that once you specify “master” or “novice” in this experience section you could get exam questions based on this choice. However, it isn’t true. This is just a pre-exam survey for helping Microsoft to know when you’re actually taking the exam – just as a beginner or after understanding a lot of tech concepts related to this exam. 2. Does passing an AZ-101 certification exam make me master in Azure integration and security? This is a common misconception to many of the candidates who’re opting for AZ-101 exam preparation. Of course, getting a certification like AZ-101 can give an upper hand when you’re looking for jobs in Azure job roles. But, imagine a situation where you’ve assigned to work in a client location where you’re unable to deploy the server by any means –regardless of the certification you’ve received. This hypothetical situation can become true if you’re only paying attention to the theoretical concepts rather than understanding what really happens on Azure server integration deployment. However, Microsoft itself has devised clear guidelines to overcome the dilemma that often candidates encounter during their AZ-101 exam preparation. 3. What about Brain Dumps? Can I use it regardless that I skipped it in my AZ-100 exam? In any performance or role-based Azure exam, there’s no guarantee of success if you follow any brain dump preparation method. As we discussed earlier, an AZ-101 exam preparation requires you to show your expertise and skill on a real-time Azure environment which is never possible with brain dumps. If you go for the brain dumps on a web search, you may get results. But, that’d be the questions asked in previous exams which are never again going to repeat. So whatever the AZ-101 Integration and Security exam study materials you have, make sure that these aren’t prompting you to move towards any brain dump methods. As a fresher, you need to give AZ-100 exam first to become Azure Administrator Associate. Start your preparation for AZ-100 exam with AZ-100 Online Course. Hope, you became aware of all the necessary details for an azure certification AZ-101 exam preparation. If you consider both exams AZ-100 and AZ-101 in a single course, it’ll help you to effectively prepare for the exams and to become a qualified Microsoft Certified Azure Administrator Associative. It isn’t a very grueling task to pass this exam if you have got a solid AZ-101 exam preparation strategy. The preparation guide will be a valuable resource for you in that sense. In case you face any trouble or need any assistance in your AZ-100 exam preparation, just mention in the comment box or write in Whizlabs Forum to get answers by the experts.